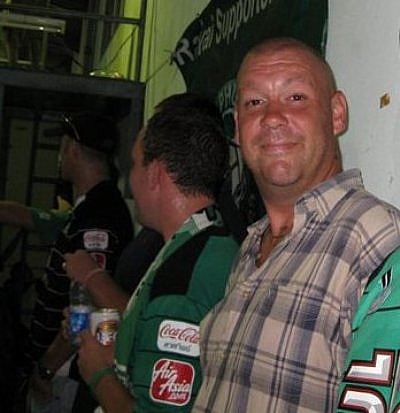 PHUKET: -- James Lakin , long-term Phuket resident and one of the founding members of the Rawai Supporters’ Club, has died at the age of 38. Mr Lakin, nicknamed “Shaggy” by his friends, died on the evening of June 23, having suffered from a heart condition. His funeral will be held at Wat Sawang Arom in Rawai today and the wake will be at the newly named Shaggy’s Bar. Originally from Wallheath, a small village outside Wolverhampton in the West Midlands, England, Mr Lakin was an engineer before moving to Phuket in 2005 to set up a small maintenance company. Mr Lakin settled in Rawai, where he became a respected and well-liked member of the local community. Known for his passion for West Bromich Albion and Phuket FC, he was a founding member of the now well-known Rawai Supporters’ Club, which has faithfully supported Phuket FC since its formation in 2010. Friends described Mr Lakin as having a great personality and a keen sense of humor. Mr Lakin was married on June 10 of this year and is survived by his wife Phadala. Tragic for James's family, absolutely horrific for the new bride. Too young to pass on. RIP James. Wow, 38 is no age at all. Seems like a decent guy who actually gave something back to his local Thai community, not just take, take, take. No word about any family back in UK. Hope someone has looked after that, as you'd expect some living relatives to be around at the age of 38. RIP... 38? Way too young.